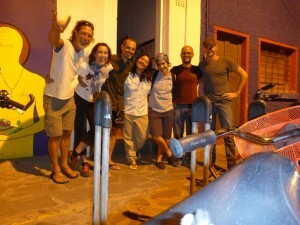 The crew in front to the Casa Ciclista getting ready to head out for pulque! It’s been three weeks now since I arrived in Guadalajara and all three weeks have been full of surprises. Some surprises have been amazing, while others have been brown and explosive. Yes, I am afraid it is true, it is here in Guadalajara that I fell victim to the age-old travelers’ curse of liquid waste evacuation; more commonly referred to as: Diarrhea. I consider myself lucky though, because if you are going to be squeezing in midnight speed workouts by doing laps from your bed to the toilet and back, then Guadalajara is the place to be. Seriously though, Guadalajara has been a fantastic experience from Day One – when I rolled through a city busy setting up for a weekend music festival – to Day Twenty One – last night’s “paseo de todos”, a casual nighttime bike ride around the city along with thousands of other cyclists. 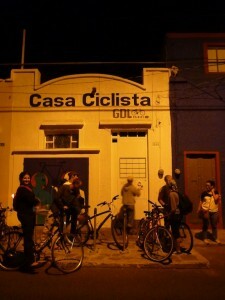 What made the time here so special though, was the Casa Ciclista, and the people that came with it. 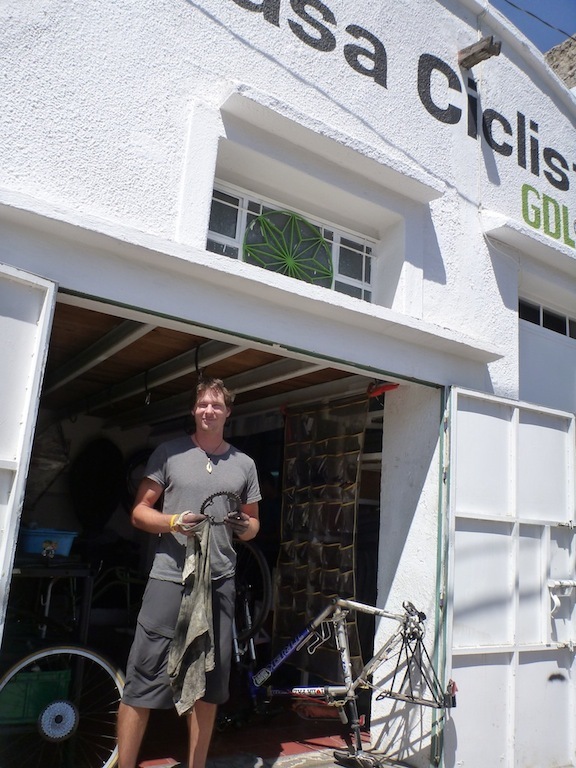 You might remember my post about the Casa Ciclista in Ensenada, but that Casa has very little in common with the Casa Ciclista here in Guadalajara. Ensenada was a wonderful offering of a place to sleep for free, but that’s all it was. 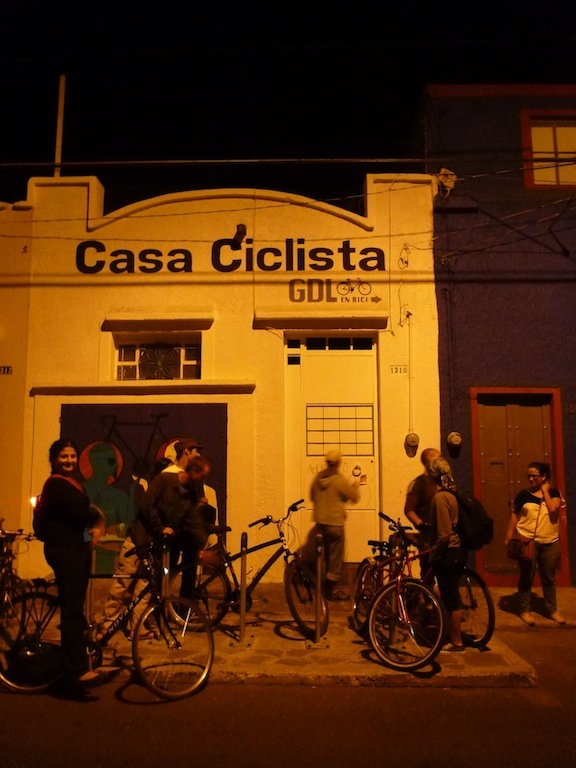 On the other hand, the Casa Ciclista in Guadalajara doesn’t just offer you a place to sleep; it offers you a home. And that home comes complete with your own dysfunctional family. Tony getting the full treatment at the Casa Ciclista. 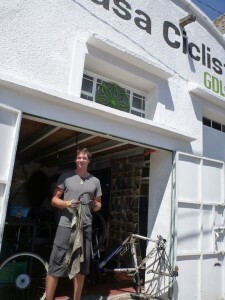 The Casa Ciclista has been around for about 2 years and first and foremost it is a bike mechanic shop. It’s secondary function though is to promote the use of bicycles in Guadalajara and to act as an advocate for the rights and representation of the casual city cyclist. They do this in many ways, including: giving people a place to work on their bike (for donation only), offering classes on bike maintenance, releasing a magazine every other month, putting up the white bicycles when a cyclist is killed on the road, organising fun rides around the city, and organising protest rides. As part of their vision, they also welcome in touring cyclists passing through and try and get them to stay forever in Guadalajara by lavishing them with unreserved friendship. The people at the heart of the CCGDL are the two main mechanics Jorge y Isaac as well as Bernardo who spearheads the other functions of the Casa. But around these three hombres is a close and colourful community of fellow cyclists, friends, and girlfriends who provide a constant stream of people passing through the Casa to have lunch, to work on their bikes, or to just hang out and drink some pulque. I arrived at the Casa the same day as Greg and Regina, a French couple riding around the world for their honeymoon, and we spent the three weeks being warmly invited to lunch after lunch, dinner after dinner, bike ride after bike ride, and random adventure after random adventure. For example, one day we were invited by Bernardo to go on a bike ride through the city. This 8AM bike ride turned into a trip to the Barratillo the city-sized flea market that takes place every sunday in Guadalajara. Our trip to the barratillo then turned into an invitation from Magui, Bernardo’s girlfriend, to come have lunch (BBQed frogs no less) at her place. The lunch invitation then turned into an invitation for us to join them and their other friends for dinner. Another day Magui, who works for Jose Cuervo, invited us to an Opera at the Jose Cuervo amphitheater in Tequila. After the hilarious opera Magui gave us an impromptu after-hours tour of some of the Jose Cuervo Facilities. Another day, there was random invitation/request that we do a radio interview for a local radio station, Radio Cyclone. 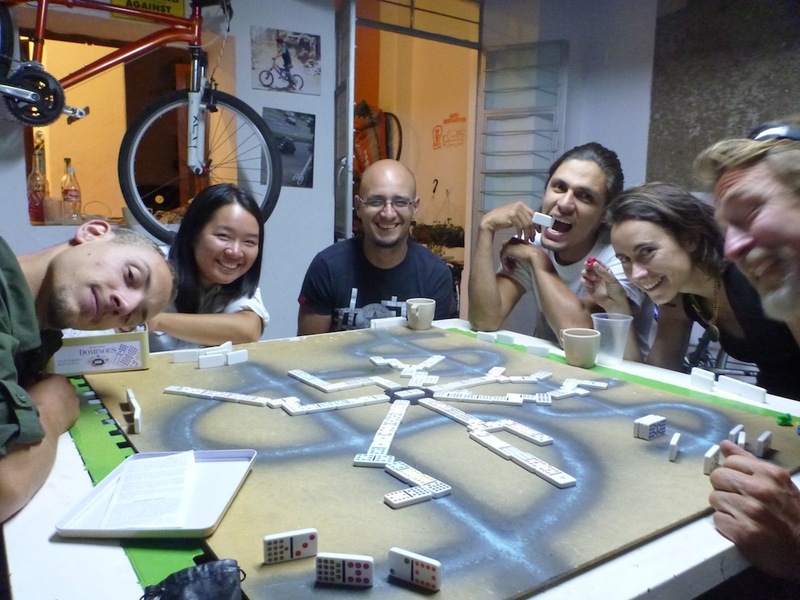 We also spent a lot of time just hanging around the Casa Ciclista, and the daily banter, including an education in the uses of the Mexican word Chingar, was a constant source of amusement. After a couple weeks in this place the kind strangers you met the first day become close friends you suddenly find it very difficult to move on. So before I go and load Toño back up with bags of gear, I´d like to take a moment to give a shout out and a big thank you to Bernardo, Magui, Jorge, Isac, Sofi, Vania, Marcos, Greg, Regina, Estefania, and all the other wonderful people who made Tony and I feel right at home here. I will miss you guys and I can only hope that the road brings us all back together again one day. Greg and Regina get ready to head off on Caballo Blanco while Isac introduces them to his girlfriend in Germany on skype. Also, if you haven’t tripped across it already, I have started a THANK YOU! 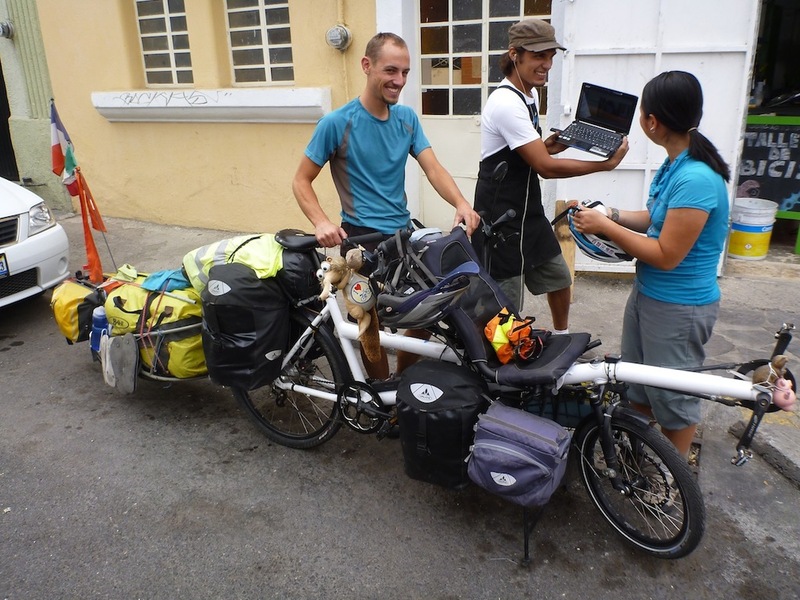 List for this adventure, as well as a BIKE BUDDIES list, a list of the other touring cyclists I have met. This is not the final blog I will be publishing for my time in Guadalajara. Over the next couple of weeks I’ll be publishing a series of blogs about my time here.